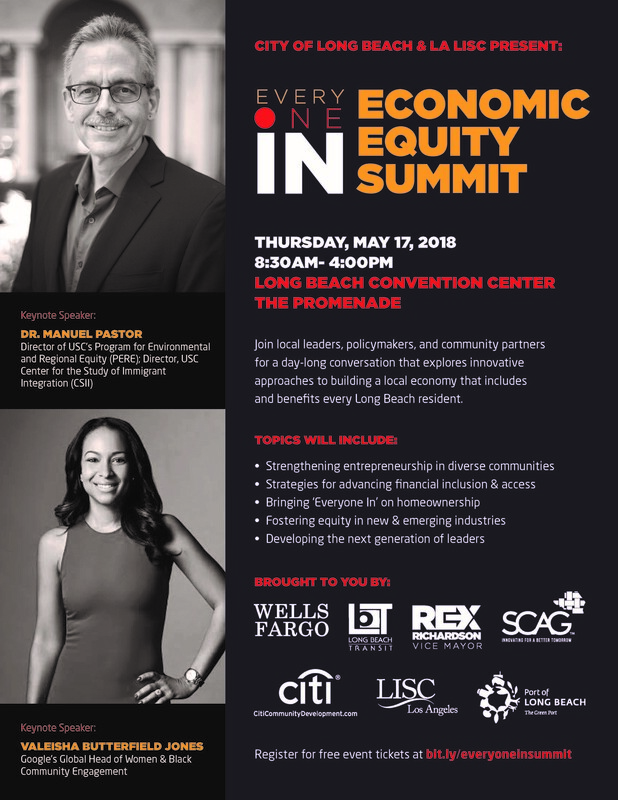 LA LISC is proud to partner with Vice Mayor Rex Richardson to host the #EveryoneIn Economic Equity Summit. LA LISC Executive Director, Tunua Thrash-Ntuk, served as Chair of the 'Everyone In' Policy Roundtable and this Summit is the culminating effort, which will bring together local business and community leaders, policymakers, and philanthropic partners for a day-long conversation. The Summit will explore innovative approaches to building a local economy that includes and benefits every Long Beach resident. If this sounds of interest to you, join us on Thursday, May 17th from 8:30 am - 4:00 pm at the Long Beach Convention Center. You can click here to register. The 'Everyone In' Policy Roundtable, which was the launching pad for this Summit, was spearheaded by LA LISC Executive Director Tunua Thrash-Ntuk and Vice Mayor Rex Richardson, who is the Vice Mayor of District 9 in North Long Beach. This district is one of the more impoverished districts that sees the least amount of resources from the City of Long Beach. Most folks that live in District 9 are low income people of color. Vedika Ahuja (Economic Equity Senior Manager of the Greenlining Institute) discussed pathways to homeownership and home lending trends. Miranda Rodriguez (Associate Program Officer of LA LISC) and Alison Lingane (Co-Founder of Project Equity) discussed barriers for small business owners and entrepreneurs. Cheryl Ryman (Vice President of Farmers & Merchants Bank), Sarah Brennan, (Senior VP of Self-Help Federal Credit Union), and Yadira Younse (Co-Founder & CMO of Lemando) discussed the future of banking in low income communities of color. Sabra Purifoy (Acting Deputy Director of LA County Department of Consumer and Business Affairs), Breanna Hawkins (Policy Director of LA Food Policy Council), and Iesha Siler (Senior Policy Advocate of LA Food Policy Council) dived deep on strategies to increase local, inclusive procurement and contracting. While the City of Long Beach is experiencing a large boom in real estate and investment in transit, LISC LA wants to make sure that low to moderate income communities aren't being left behind. The momentum that has been created with the Roundtable would not have been possible if it were not for the community partners, thought leaders, and funders who spent the last six months sharing their ideas and vision for a more inclusive Long Beach. Thank you for supporting these conversations and we look forward to continuing the discussion at the Summit! Have thoughts you want to share on these topics? Tweet us at @LISC_LA or e-mail us at LALISC@lisc.org. We want to hear from you.